When I was a kid, the word on the playground was that while the Super Nintendo could display more colors, the Genesis had better sound. Few games demonstrate the console’s superiority in that category better than Streets of Rage. With a brilliant techno soundtrack by Yuzo Koshiro, also known for scoring ActRaiser, The Revenge of Shinobi and Streets of Rage 2, the game is worth playing for the music alone. You can choose from three characters, all ex-cops out to rid the city of an evil, criminal organization. The game spans 7 stages, starting in downtown Capital City, and ending in the bad guys’ headquarters. Like any good beat ’em up, the game allows for two player cooperative play. By breaking garbage cans and telephone booths you can pick up bonus items like health power-ups, extra lives, and most importantly, weapons. Bats, pipes, knives, bottles, and perhaps the coolest, smoke bombs that stun your enemies. The bottles are also nice because after breaking them over your opponent’s head, you can stab them with the sharp stump that’s left over. You also get a limited number of calls to the police, who will show up in their car and, from a distance, fire rockets at your enemies. The game does have a few flaws, though. The player animations are a little bit too jerky, a lot of the sound effects are sub-par, and the graphics can be ugly in places, especially in stage 3. Overall however, the graphics look very good for an early Genesis title. 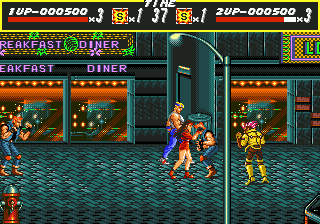 In terms of gameplay, Streets of Rage feels more like an 8-bit game than it does like later games from the genre on the Genesis and SNES. The game stands head-and-shoulders above most other beat ’em ups released prior to it, but it hasn’t aged well in comparison to subsequent beat ’em ups of the era, like Streets of Rage 2 and Batman Returns. Buy Streets of Rage on GameGavel or Amazon. Tagged Beat 'em Up, genesis, Review, sega, Streets of Rage. Bookmark the permalink.